An unmatched beachfront location offering splendid views of sparkling Aegean Sea – what better way to spend a relaxing beach holiday? Located on the picturesque bay of Gümbet in Turkey’s Bodrum, the family-friendly Asteria Bodrum offers a comfortable stay in modern, well-appointed rooms that boast an architectural design inspired by the traditional bougainvillea-covered houses found on the Bodrum streets. With half a dozen buffet and a la carte restaurants serving Turkish and international cuisines, the hotel indulges the palate of every gastronome. There are seven bars on site, including the resort disco and a pool bar that give you ample opportunities to enjoy a drink while looking out to the scenic Aegean. But if you want to spend some more – may be a lot more – time splashing in the waters, take a dip in the outdoor pool with fantastic views of the sea, swim in the indoor pool or enjoy the sun on the private beach in special pavilions. The hotel also offers fun activities like water sports, dance classes, outdoor sports, billiards, table tennis or PlayStation. Evenings are made fun with shows, theme parties, cabaret and other entertainment activities. With an aqua park, kids’ pool and fun activities for children, even the young guests will be engaged, while you pamper yourself in the spa which offers massages and therapies from around the world. But most importantly, it’s the sheer beauty of the hotel and its excellent Turkish hospitality that will make your stay memorable. 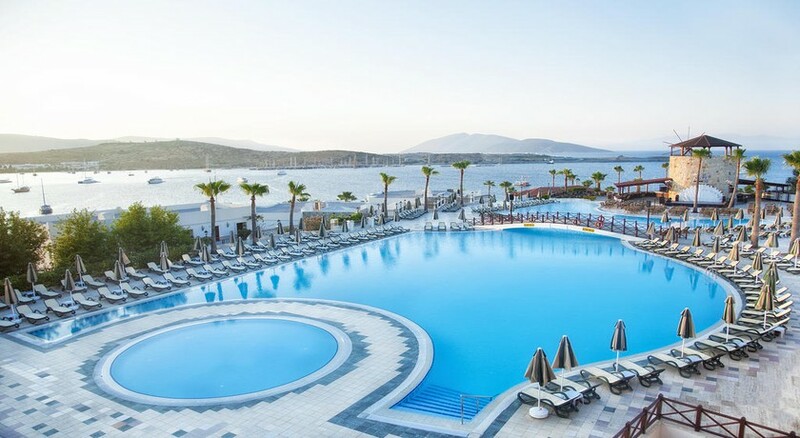 The luxurious beach hotel enjoys a fabulous location on the Gümbet bay in Bodrum, offering outstanding views of the Aegean Sea from the rooms and its pools. Boasting a lively and cosmopolitan vibe, the hotel has all the amenities to ensure a relaxing stay. The sandy beach is 200 metres from the hotel, so reaching the beach is just a 5-minute walk from the property. The Bodrum town centre is 4km away and the Bodrum Castle is 5km from the hotel. The distance from the hotel to Milas-Bodrum Airport is 35km. The guest rooms at Asteria Bodrum, Gümbet are well-furnished and appointed with modern amenities. The rooms and suites come with a balcony or terrace which offers unforgettable sea views. There are standard rooms, family rooms and luxury suites, all of which come fitted with amenities such as central air conditioning/heating, en-suite bathroom, hairdryer, telephone, tea and coffee facilities, minibar, safe, LCD TV with satellite channels, housekeeping. The hotel also has bunk bed rooms as well as specialised room for disabled guests. Across all categories of rooms, it’s the incomparable hospitality provided by the staff that forms the core of the hotel. A variety of recipes – from traditional Turkish to international delights – are served with modern presentations at the six restaurants of Asteria Bodrum. The main restaurant, Amadeus, offers a rich open buffet for breakfast, lunch and dinner. There are also baby corner, diet and vegetarian buffets are served at Amadeus restaurant. The a la carte restaurants in the hotel prepares a host of cuisines that includes Turkish dishes at Sini, Italian cuisine at La Gondola, Mediterranean delights at Sancak and grilled and barbecue dishes at Mangal Park. The Sini Patisserie has a range of desserts and sweet treats for guests. For those who want to enjoy sea views while sipping on their favourite cocktail or enjoy a drink by the pool, the hotel has seven bars on offer. Watch the Aegean Sea from the beachfront Seyir Bar or Beach Bar, enjoy refreshing drinks at the poolside Havuz Bar, or sit on the top of a specially designed windmill Değirmen, which serve as a cafe at noon and in the evening as a bar. Those who prefer heathy drinks can visit the Vitamin Bar, or if you’re looking for a relaxing time, check out the Relax Bar. The Disco Bar is a great place to spend the evening with music and dance. The beachfront location of Asteria Bodrum gives guests the opportunity to lounge on the hotel’s private beach or enjoy water sports such as surfing, canoeing, banana boats, catamaran cruise, wakeboarding, parasailing, water skiing and jet skiing. The beach is 200 metres long with two guest piers and a pavilion pier. There are outdoor swimming pools including children’s pool, indoor pool, relax pool and aqua park with water slides. The on-site spa offers massages and therapies to rejuvenate your body and mind. Guests will find a variety of daytime activities ranging from outdoor sports, indoor games and even dance classes. The hotel has a tennis court, aerobics centre, dancing piste, running track, mini football pitch. The games room offers amenities for indoor games such as table tennis, billiards and PlayStation. Evening entertainment includes special shows, theme parties, cabaret and dance performances. Wow Bodrum Resort has a number of activities and entertainment options for kids so that the little ones enjoy a wonderful holiday. There’s a mini club, kids’ buffet at Amadeus restaurant, mini disco, aqua park with slides, children’s pool, themed activities, pool games, face painting and lots more. The teen lounge offers non-alcoholic beverages and indoor games for teenagers aged 13-16 years. A beautiful resort, very welcoming staff and excellent variety of food! Awesome hotel with fantastic facilities and friendly staff. Five star all the way hope to be back soon. WOW Great Hotel & Great Staff, didn't want to come home. Everything one expected from World of Wonders! Used as a base and place to relax whilst exploring the Bodrum Peninsula. Food was varied and plentiful, great selection of drinks on all- inclusive with the nice option of 3 restaurants other than the main buffet dining. location was probably the best in the area and staff were professional and friendly. Room was comfortable, clean and tidy with the only downside being one could hear the neighbouring room...so soundproofing could be better....though we might just have had noisy people next door! Stayed here for a week in march and could not fault anything about the place ..from the food to the service all was excellent..the animation team were top notch ..best I've experienced in any hotel ..
Lovely hotel with friendly staff. Enjoyed the quiet pool as well as the larger family pool and private beach. The only downside to the restaurants were the cats that swarmed around, encouraged by some guests and staff! Wonderful pool area and attentive staff. High standard of cleanliness throughout the whole complex and rooms. Could be difficult for people with disability as perched on steep cliff with steep paths down to rooms and beach. A la cartes are superb particularly the Italian.